Located on the Families tab in the Families/Students section of the Reports menu, the Contact Listing Report creates a listing of your contacts based on specific search criteria. Using your selected criteria, Jackrabbit will compile a listing of contacts who meet ALL of the criteria chosen. You would like to find contacts who are authorized to login to the Parent Portal, but who have never logged in and send them an email to encourage them to start using their Portals. The report results include all contacts that have Allow to login to Parent Portal selected in their Contact record. 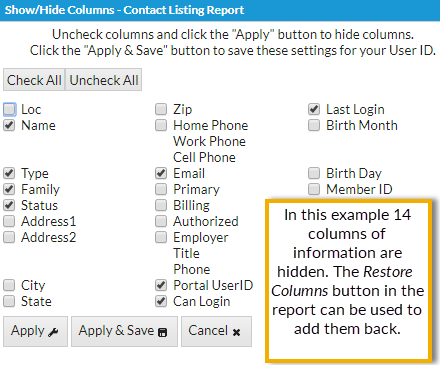 To keep the report clear and concise, 14 columns of information not related to Parent Portal use were hidden (as shown in the Show/Hide Columns image above). Using the checkbox in the Email All column, you will select those contacts who do not have a date/time in the Last Login column and then click the Email button to compose and send the email. A copy of this email will be retained in the Family record, on the Misc tab for 180 days.